Two headlines have highlighted the ‘here and now’ of the threat of rising antimicrobial resistance (AMR), writes Dr Peter Jackson. A study reported in The Lancet Infectious Diseases found that antibiotics are now failing to work in a fifth of patients who suffer an infection after hospital surgery. This global research, looking at 13,000 patients across 66 countries, found that over 12% of those undergoing procedures developed a post-operative surgical site infection (SSI). Of these, 22% of cases were resistant to commonly-prescribed antibiotics, with drug resistance rates varying from over 16% in more developed countries, to 36% in less developed regions. The farming industry has also come under scrutiny. In January, investigative journalists uncovered the story that thousands of tonnes of the antibiotic Colistin (Polymyxin E) were being fed routinely to chickens in India as a growth promoter. Researchers and healthcare professionals around the world were horrified at the news. Colistin is considered the last line of defence against multi-drug resistant organisms. Using it in this unregulated way as an animal feed supplement is unacceptable and is banned in China and Europe. In 2017, the US government also restricted the use of antibiotics as growth promoters in livestock. Yet Colistin resistance is already here and spreading worldwide. Two years ago, researchers reported the emergence of plasmid-mediated Colistin resistance (MCR) in isolated E.coli strains in China. The MCR mutations found so far (MCR-1, 2 and 3) are on plasmids, sections of DNA that can be transferred from one organism to another, opening the door to widespread Colistin resistance across multiple bacterium types. By January 2018, the US Centers for Disease Control and Prevention reported 29 cases of MCR resistance identified across 15 states of the US. 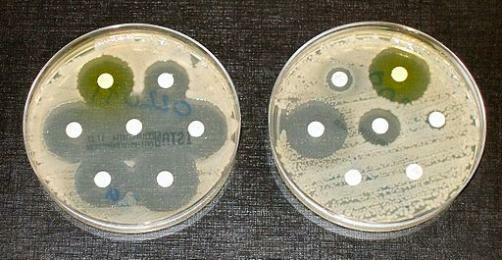 News of rising resistant infections and the abuse of Colistin in farming shows why we need to redouble our efforts to find new ways to treat drug resistant infections. Lord Jim O’Neill’s Report on AMR two years ago, supported by the UK Government and the Wellcome Trust, was an important catalyst for action. Alongside this, there have been important initiatives by the World Health Organization (WHO), the European Union and the US Government, and an unprecedented global declaration on AMR at the United Nations General Assembly in 2016. A critical part of the challenge is to produce a new generation of therapeutics, preventatives and diagnostics to combat the rise and spread of multi-drug resistant organisms. The WHO has published an authoritative list of the target pathogens for current and future research efforts. Alongside drug-resistant TB, the most “critical” targets are carbapenem-resistant Gram negative organisms Acinetobacter baumanii, Pseudonomas aeruginosa and Enterobacteriaceae species. “Serious” targets include Staphylococcus aureus, Salmonella species and Neisseria gonorrhoeae. And we are making progress on mobilising international collaboration to develop a new pipeline against AMR, with hundreds of millions of dollars pledged worldwide to stimulate R&D, through international initiatives such as CARB-X (US Government and Wellcome Trust), GARD-P (WHO and DNDi) and the EU’s IMI programs DRIVE-AB, ENABLE and COMBACTE. Here in the UK, the R&D teams at the AMR Centre, a key part of the UK’s response to AMR, is working with biotech companies from the UK, US, Sweden and Russia to fast track new treatments into clinical trials for patients with life-threatening infections. But there is much more to do. Microbes will continue to evolve to become resistant to new treatments in time, so our research will by necessity be never ending. To keep up this work will require funding and the influential DRIVE-AB report sponsored by the EU and published in January called for at least a 50% increase in R&D funding for new antibiotics, as well as for substantial new incentives for drug developers to bring their innovative products to market. Alongside public money, we also need private investment in the form of capital to support innovative biotech companies, or from major pharmaceutical companies re-joining the anti-infectives sector and committing to increase their R&D spend. The translation of technology from academic labs to the biotech community for pre-clinical and clinical development, either as spin-out companies or out-license deals is particularly difficult in the anti-infectives space. Investors find it difficult to put a value on antibiotics programs in the absence of a clear market ‘pull’. There is also a capability gap, especially for academic researchers to undertake the important first stages of validation of their targets and generate ‘hits’ to move forward into pre-clinical testing in vivo. Such projects are often too early for consideration by the international AMR funds and often have to compete for resources with projects in other therapeutic fields. It is not surprising that the Medicines Discovery Catapult, a UK Government-funded technology accelerator, reported that translational medicine in the UK was underpowered compared to strengths in basic science in infectious disease. This conclusion also highlights the need to focus on the training and education of AMR specialists across the translational space. We need to train more laboratory and clinical microbiologists, as well as making working in infectious disease a more attractive career choice for researchers. Finally, we need to remember why this is important. In 2016, a 70-year old woman returned to the US from a visit to India, where she was treated in hospital after badly breaking her leg in an accident. The wound became infected and she became seriously ill, unfortunately dying from sepsis in hospital. Analysis of samples taken from the wound showed that she was infected with a strain of Klebsiella pneumoniae, which was resistant to all 26 drugs available in the USA, including Colistin. So, please join the mission to combat AMR.